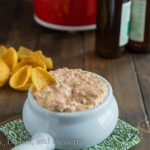 Crab Rangoon Dip – Classic Crab Rangoon filling made into a warm dip with fried wonton wrappers for dippers. Great for parties or just snacking. Are you a dip person? My family goes crazy for dips of pretty much any kind. 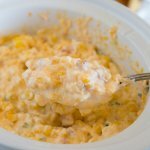 Your basic Beer Cheese Dip is always a hit. But then something like this crab rangoon dip is a nice twist. When I have a party, I love stuff I can make ahead of time. 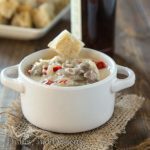 Bacon Cheeseburger Dip is something you can assemble the day before, and then just heat the day of your party. Definitely my kind of party food! When we get Chinese take out, crab rangoons are pretty much a staple. They are down right addicting, and are included every time we order. 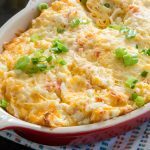 This crab rangoon dip is pretty much the exact same! Just all the delicious center of the rangoon in dip form. 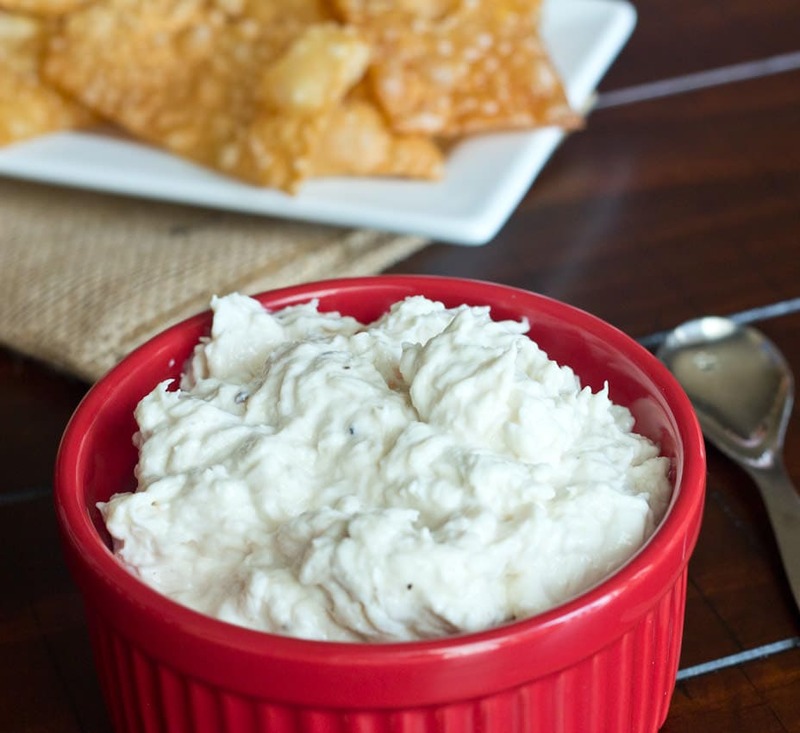 Our favorite crab dip is another great appetizer if you are looking for seafood ideas. 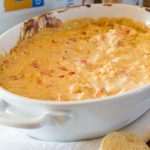 Everyone pretty much loves anything with crab, and this crab dip recipe will disappear in no time at your next get together. 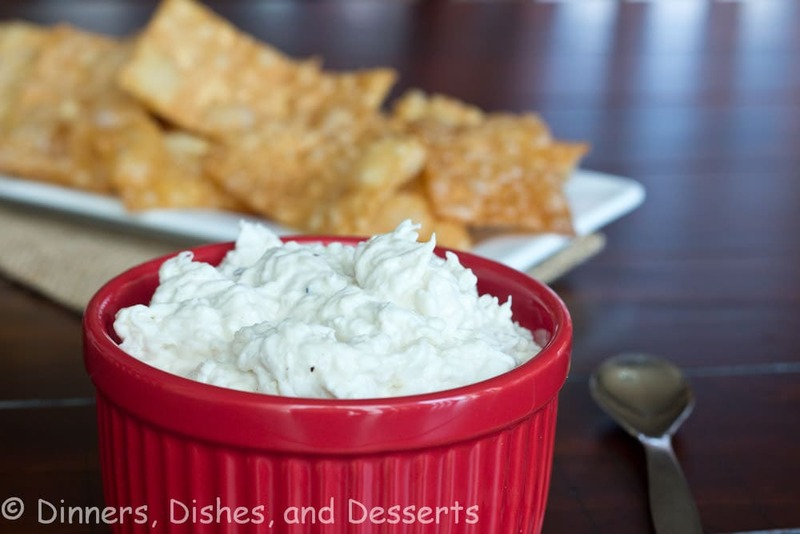 I have made this crab rangoon dip for a few parties, and it always goes quickly. You can serve with just about any dipper you like, but I always go all out and fry egg roll wrappers. This makes it more like the delicious appetizers you get with take out. You can use canned lump meat crab to make this, or you can get the fresh stuff from fish counter. The imitation stuff will work, but definitely not be quite as tasty. But can you ever really go wrong with a dip you get to dip fried egg roll wrappers in? 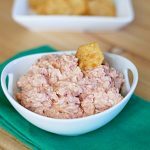 This cran rangoon dip would be a huge hit if you are looking for Super Bowl food ideas. In the morning you can mix everything together, and put it in the fridge. Then a couple hours before the party starts, put it in the crock pot to get warm. In a bowl mix all of the ingredients together for the dip. Heat in a 400 degree oven for 10 minutes, or put in a small crock pot over low heat for 2 hours. In a large pot, pour in 2 inches of canola oil. Heat over medium high heat, until about 375 degrees. Working in small batches place strips of wontons into the pot. Cook for about 1 minute, turn them and cook for another 1 minute, or until lightly golden brown. Remove to a wire rack to drain and cool before serving. Ummm this needs to be re-labeled “crack” dip. Because that’s what it would be to me! I could make this with fried rice wrappers and it would be gluten free! I love this!!! Great idea Kristen, hope you enjoy! I LOVE this Erin. Crab Rangoon is a favorite guilty pleasure so this sounds to die for. YUM! Crab Rangoon is a great weakness of mine. I’ve been known to ask for it for a whole meal instead of an appetizer. This is a brilliant idea even if someone else came up with it also! 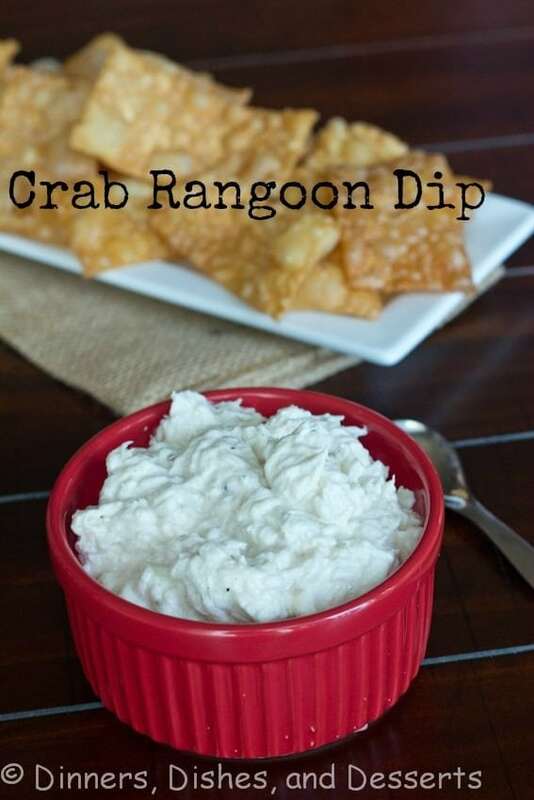 Crab Rangoon’s are one of my favorite appetizers, I can’t wait to try this! Thanks Anne, hope you enjoy! This sounds incredible! Love crab rangoon! What a delicious dip, I love the wonton chips! Hi Erin, love the recipe, but I was wondering what could possibly be substituted for the wonton strips? 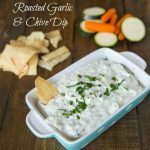 I’m not sure what else would pair well with this dip but in a pinch I would rather not have to fry all the strips! Lot of stores sell fried wonton strips, you could check there. You could also spray the wonton wrappers with nonstick spray, and bake at 400 degrees for a few minutes, until they are crispy. Ritz or Triscuit crackers would probably be good too. Hope you enjoy! I love it! I have made crab wontons and they are one of my favorites. Making it as a dip is even easier. Great recipe!! Thanks Jennifer, hope you enjoy! YUMMM! I love crab rangoon!! My husband loves crab rangoon. I think I need to make this for him soon! Great recipe! This looks so delicious. I just saw it on twitter and came over. We have a link party called Wednesdays Adorned From Above Blog Hop and would love to have you share this and any other posts with everyone. It runs from Tuesday night through midnight Sunday. Here is the link to the party. I love crab rangoon, so this must be incredible! What a fantastic weekend treat! Loos good to me, love the wontons for dippers too. I love crab rangoon so much!! This dip looks amazing and I would probably eat all of it. You did hold out! Wow, this is yummy! 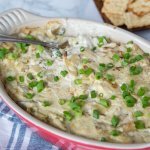 Love crab and am always looking for new dip recipes. Love the wontons! Sounds delicious! 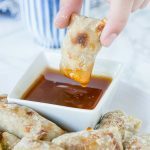 Such a great appetizer, love that you served them with wontons! I meant to make this for the Super Bowl and completely forgot! I wonder what the next excuse I can find to whip it up will be… I just love crab rangoon! 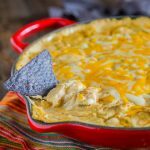 Who wouldn’t love diving into this delicious dip! Glad that you shared it with all us. You could use a little bit of regular sugar to sweeten it up, or just skip it. It won’t be quite as sweet, but that is perfectly ok!! Hope you enjoy! I think that going all meatless, and just leaving out the crab would be kind of weird. But I think chicken would work. 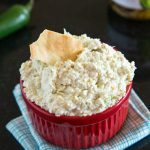 I am not a fan of tuna, but I think it would be ok. You could make the base, and then try just a little chicken or tuna in part of it to see what you think. If you try it, let me know what you think! I made this over the weekend for a birthday party and it is sooooo good. 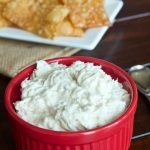 I used egg roll wrappers because the store had no wonton wrappers and this dip was a huge hit. Very Very good!!! Yeah!! So glad it was a hit at the party! No need to fry the wontons. Cut into triangles, spray, or brush with oil and bake. Nice and crispy. When I really want to treat myself, I’ll order crab rangoons when I order Chinese food. 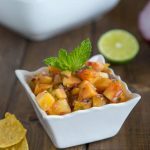 I love them so much but my hips – not so much 😉 This recipe my hips can agree with! I fried them in the morning, and the dip was served at night, and they were still crispy and perfect. I wouldn’t do them more than 1 day ahead of time though.